Back to Global Climate Debate index page. Does the world really need a clean energy 'moonshot'? Microsoft co-founder Bill Gates announces at U.N. climate talks in December the Breakthrough Energy Coalition and Mission Innovation efforts to boost clean energy research. Photo courtesy of AP Images. Second in a two-part series. Click here for part one. The Obama administration celebrated the Breakthrough Energy Coalition at last year's Paris climate summit as evidence that some of the world's most successful financiers back the president's agenda of addressing warming. But the pledge by Microsoft Corp. co-founder Bill Gates and others to channel resources toward revolutionary new energy technologies reopened a long-standing debate over whether billions in private-sector dollars should be spent chasing an "energy miracle" or helping market-ready technologies gain traction. "I don't think it's an 'either-or' thing; I think it's an 'all' thing," U.S. Special Envoy for Climate Change Jonathan Pershing said of the innovation-versus-deployment conundrum in a recent interview with ClimateWire. But some clean technology and climate change experts say it's dangerous to send a message that today's technologies aren't enough to help move the world in a less carbon-intensive direction. By chasing "breakthroughs," they say, Gates and the 27 other members of the investors coalition are encouraging governments and the private sector to reduce their investment in today's technologies, or even giving cover to those who would prefer to delay action. Those advocates find fault with the Department of Energy's emphasis on early-stage research and with Gates' association with some opponents of mandatory carbon-reduction policies. The investors' coalition has signaled it will put forward in the neighborhood of $3 billion to support "moonshot" technologies. That's a small effort in the global energy landscape, but it has an outsized symbolic role since it signals buy-in from some of the world's richest people to fight climate change. It may also sway governments to follow their lead — which many clean energy experts worry will divert public dollars away from deploying the wind, solar and other power sources already available. 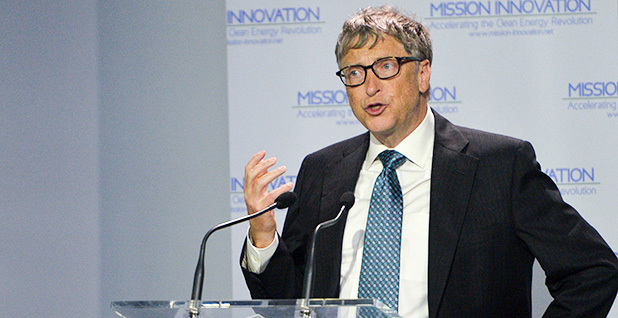 Gates and his collaborators say innovation is key. "The world needs widely available energy that is reliable, affordable and does not produce carbon," the coalition states on its website. "The only way to accomplish that goal is by developing new tools to power the world." Many advocates of action to contain emissions both inside and outside the administration agree with Gates that advanced energy research and development is essential, or at least an important part of the global response to climate. 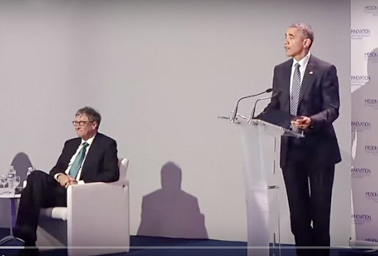 President Obama announces at the U.N. summit in Paris last year a plan to double research and development funding for clean energy research among 20 countries as well as a multibillion-dollar "breakthrough" effort by billionaires led by Bill Gates. Photo courtesy of the Department of Energy. But others say Gates' laserlike focus on new technologies is misplaced. It vastly underplays the value of today's renewable energy, they say, which is an error not only because those technologies have improved so much in efficiency and economic viability in recent years but because they're ready to go and time is at a premium. "I think there are some really compelling arguments that say we have a lot of important tools now," said Greg Dotson, vice president for energy and climate at the Center for American Progress. "They can be improved, but given the time frame of what we're talking about for emissions reductions, there just needs to be a lot of focus on getting the technology we already have deployed." Scientists say that to meet the Paris goal of keeping warming to well below 2 degrees Celsius, global carbon dioxide emissions should peak by 2020 and be halved by 2050. But breakthroughs could play only a limited role in the next few decades because it takes so long for them to achieve market penetration. "It's pretty easy to see that you might not have anything that's up and running at all for a decade, and then you face the same challenge of deploying at scale that we're facing today," Dotson said. "It doesn't really matter if some miracle emerges in the next two decades because CO2 emissions are cumulative," echoed Joe Romm, founding editor of Climate Progress. Meanwhile, today's technologies are growing as a share of the world's total energy portfolio, and the scale-up is pushing prices down globally. The International Renewable Energy Agency last month projected that solar energy costs would fall 59 percent below 2015 levels by 2025, while onshore wind energy prices will tumble 26 percent in the same period. That is the "energy miracle" the world has been waiting for, say some clean energy advocates. Governments and investors, they argue, should make the most of it. "The technologies that are going to do most of the emissions reductions are good old-fashioned solar, wind and energy storage," Romm predicted. Gates didn't make his billions focusing on old-fashioned technologies, and they have never prominently figured in his solution to climate change. In fact, the software billionaire in the past has seemed to disparage state-of-the-art renewables. During a 2011 appearance in New York City, for example, Gates dismissed what he called the "cuteness" of small-scale distributed renewable energy. Without a technology breakthrough, he charged, burgeoning developing world emissions would swallow all of the emissions gains made by the developed world through efficiency. And the billionaire has on a few occasions made common cause with lawmakers and climate contrarians who favor technological innovation as the sole response to climate change. In 2014, the Microsoft founder posted two videos by Bjørn Lomborg, director of the Copenhagen Consensus Center and author of "The Skeptical Environmentalist", who argues that poverty is a greater threat to humankind than climate change, which should only be addressed by making green energy competitive with fossil fuels on a purely economic basis. Gates appeared to echo Lomborg's sentiments. "Instead of putting constraints on poor countries that will hold back their ability to fight poverty, we should be investing dramatically more money in R&D to make fossil fuels cleaner and make clean energy cheaper than any fossil fuel," Gates wrote in the post. Sen. Lamar Alexander (R-Tenn.). Photo courtesy of Wikipedia. He also earned a mention in the floor speech Sen. Lamar Alexander (R-Tenn.) gave last month when the lawmaker introduced legislation to cancel federal support for existing renewables and redirect the funds to DOE's Office of Science for funds toward research for next-generation technology (ClimateWire, June 3). "Instead of rhetoric and ever-larger subsidies of today's inefficient green technologies, those who want to combat climate change should focus on dramatically boosting innovation to drive down the cost of future green energy," Alexander said, offering the federal research that led to hydraulic fracturing as an example of effective government support for low-carbon energy. In an interview with ClimateWire the following day, Alexander praised Gates and the other BEC members as "very generous" for pledging capital to sherpa technologies over the "Valley of Death" between laboratories and commercialization. But he blamed the federal government for refusing to "step up" its own support. He declined to say whether he'd continue to back the Obama administration's own pledge with 20 other governments to double energy R&D funding through 2020 as part of DOE's Mission Innovation initiative if that expenditure was not offset with tax hikes on renewables. Gates' "innovation-first" messaging has also gained apparently unsolicited support from one of the climate movement's foremost recent antagonists. Exxon Mobil Corp. CEO Rex Tillerson said of Gates at his company's shareholder meeting in May that "there's no space between he and I" on climate change. Rather than advancing the policies that "turn the taps off" on the petroleum Exxon produces, Tillerson cited Gates' breakthrough effort to argue that finding future technologies was the answer. "The reality is there is no alternative energy source known on the planet or available to us today to replace the pervasiveness of fossil fuel in our global economy and in our very quality of life, and I would go beyond that and say our very survival," he said. Gates has never questioned the science of warming. But clean energy entrepreneur Jigar Shah compares what he sees as the billionaire's refusal to acknowledge the current state of renewable energy technology to some conservatives' rejection of climate science. "He's basically saying the technology that exists today is not worth deploying at scale," he said. "And he's been refuted by every major organization on the planet." The International Energy Agency (IEA) estimates renewable energy grew nearly 15 percent last year in developing countries propelled by falling prices. Since Gates stood next to Obama on that platform in Le Bourget airfield in November and introduced his coalition, Gates has substantially moderated his tone on current technologies. A paper explaining the coalition's mission released then touted their potential, especially if gains are made in energy storage, an area many renewable energy advocates wish to see BEC focus on. And he said in a blog post in June that he didn't see the coalition's quest for a breakthrough as a "zero-sum game." "Successful industries that are built on innovation rely on both deploying the technology they have and developing the technology they need," he wrote. He called IEA projections about near-term green energy deployment "exciting," but added that research must be conducted simultaneously to ensure technologies improve over time. 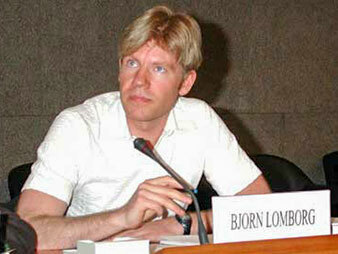 Bjørn Lomborg. Photo courtesy of the World Trade Organization. "Think about the days when dial-up Internet service seemed like a miracle," wrote Gates, returning to an industry he knows well. "We did what we could to make sure as many people as possible benefited from it — but we also kept pushing for broadband access. Both were important." But Shah said energy isn't like the technology fields Gates dominated for decades. "The problem with these Silicon Valley people broadly is that they all actually think that technology is at the root of all problem-solving," he said, including the Seattle-based Gates in that milieu. In fact, said Shah, promising technologies are often stymied by policies, like subsidies on incumbent fuels or regulations on new industries that prevent that first investor from wading in. He argued that Gates' focus on technology diverts attention from the study of those economic and policy barriers. And he lamented that the Energy Department appeared to have the same prejudice — spending resources on incremental updates to long-established engineering and science questions instead of conducting new research on why technologically ready but neglected industries like combined heat and power are not gaining traction. "This is my big beef: They hired two scientists to run DOE," he said, referring to Obama Energy Secretaries Steven Chu and Ernest Moniz, both physicists. "What message are they supposed to send to me? Clearly that they're focused on research." A DOE spokesman said the department is in communication with a wide variety of entrepreneurs and private-sector players. "Significant investment will continue to be driven by both the groundbreaking innovation and the tangible business opportunities that exist in the clean energy sector," the spokesman said. But he did not respond to questions about the department's level of support for deployment. Romm, who led DOE's Office of Energy Efficiency and Renewable Energy during the 1990s, said the federal government should play a major role in energy deployment along with the kind of research and development Gates envisions. "We're clearly not investing enough in R&D and deployment," he said. "To achieve the current unanimous goal of keeping warming below 2 degrees Centigrade, we have to across the board spend more money." While he was at DOE, the department debated whether to invest in long-term projects that could have a massive environmental payoff or to support companies that could make a dent in the marketplace, and in the end, DOE set its sights on energy research whose payoffs were years away. "If something looked like it needed 10 years, it looked like a place for the federal government," he said. In the years since, costs for wind and solar energy have plummeted, so the focus should now be getting renewables online and taking fossil energy off the grid. "If I had Gates' money or if I were advising Gates, I would not say I'm going to devote all my money to the early-stage part of the process," he added. "Every part could use more money." Pershing, who is now U.S. climate envoy but attended last year's Paris gathering as one of the Energy Department's top energy technology ambassadors, echoed that point. "We have technologies in place today that can really ramp down emissions, there's no question," Pershing told ClimateWire. "But we have to think about this in the context of what happens in 2050, what happens in 2075, how you get to a 2100 number. And at that point we have to be pretty close to net-zero emissions for our global economy. And we don't have all of those solutions yet." Pruitt lands job as coal lobbyist in Ind.